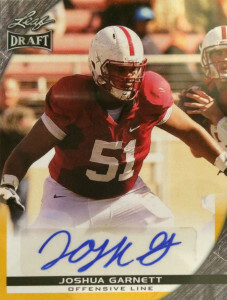 Considered by the college ranks to be one of the best interior lineman available manning the guard position, Joshua Garnett won the Outland Trophy in 2015. Garnett (6-foot-5, 321 pounds) was a first-team All-Pac-12 selection and helped clear running room for Stanford’s star running back Christian McCaffrey, a finalist for the Maxwell Award. Garnett played collegiality for the Stanford Cardinal, and hopes to become a trauma surgeon once his days playing football are over. In his previous years at Stanford, he played alongside future 1st rounder Andrus Peat. Garnett was expected to be an early pick in the 2016 draft, and considered a solid round 2 or 3 selection. With a run on quality offensive linemen however, before round 1 was over, the 49ers traded back in with the Chiefs and selected Joshua with the 28th pick.